In 1998, Bill Clinton and John Glenn exchanged emails between Earth and space, making presidential history. The laptop Clinton used to send the email sold for $60,000 on April 16, 2014. Long before the first Instagram was sent from space, the first ever check-in from orbit, or even the first astronaut's tweet, John Glenn sent an email. But this wasn't just any email. By 1998, during the original Mercury astronaut's celebrated space shuttle flight, email was fairly common. The first email sent from a spacecraft preceded Glenn's STS-95 mission by some seven years. That space-to-ground exchange was, of course, digital and so existed only virtually. But the computer that President Clinton used to send and receive the emails was saved by its owner and on April 16 sold at auction for $60,667. "It's a remarkable [item] that represents the dawn of a new age," Bobby Livingston, vice president of RR Auction, the Boston-based auction house that sold the laptop, said in a statement. "[It combines] America's greatest technological achievements — space travel and the Internet." "Writing to a President from space"
On Nov. 6, 1998, Glenn typed out his email using an IBM ThinkPad computer onboard space shuttle Discovery. The septuagenarian, Glenn was 77 at the time of the mission, came 36 years after he became the first American in orbit and established him as the oldest person to fly in space. "This is certainly a first for me, writing to a President from space, and it may be a first for you in receiving an E mail direct from and [sic] orbiting spacecraft," the astronaut-turned-Senator-turned-astronaut wrote in part to Clinton. "I want to personally thank you and Mrs. Clinton for coming to the Cape to d/see [sic] the launch. I hope you enjoyed it just half as much as we did on board." The Clintons had been at NASA's Kennedy Space Center to see Discovery lift off on Oct. 29, 1998. Bill Clinton was the first and only president to see a space shuttle launch in-person over the course of the 30-year program. "Thanks for your message. Hillary and I had a great time at the launch." the president replied, making email history. "We are very proud of you and the entire crew, and a little jealous." 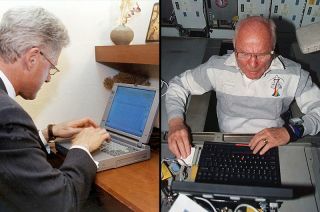 Darling's Toshiba Satellite Pro laptop still has saved the emails Bill Clinton sent to and received from John Glenn in space. Clinton, who in general did not use email while in office out of security concerns, was visiting with friends in Arkansas when the White House was alerted John Glenn wanted to send him a note. Recognizing the potential historic nature of the request, the president's staff scrambled to locate a computer to use. That was when Robert Darling stepped forward. Darling, a commander in the Navy Medical Corps and the White House physician, volunteered his personal Toshiba Satellite Pro laptop and America Online email account for the long-distance message. "[Clinton] seemed to really enjoy himself, particularly when he pressed the 'send' key and realized that at that instant his message was traveling through cyberspace and into real space on the orbiting shuttle several hundred miles above the surface of the Earth," Darling wrote in a memo for the "official NASA record," which he sent to the NASA administrator in August 1999. Included with the memo was a photograph of Darling and Clinton, the latter sitting at a desk with the loaned laptop. The president inscribed the photo to Darling, "Thanks not only for keeping me healthy but for getting my message into outer space!" Darling preserved the emails on the aptly-named Toshiba Satellite, on its hard drive and backed up on a floppy disk. The messages can still be read using the AOL application on the laptop. Had Clinton, like Glenn, used a government computer for the exchange, then the laptop would have had to first pass through federal property channels before it could be sold. In the process, it would have likely had its files removed, including the emails. In 2000, Darling consulted the U.S. Navy about the ethics of selling the Toshiba before putting it on the market. "Your laptop computer has always been your personal property, and the government obtained no property interest by virtue of its one time use by the President," the Navy's ethics counselor wrote. "Accordingly, it is yours to keep or sell as you choose." RR Auction sold the laptop on behalf of a private collector. They did not disclose the identity of the winning bidder. Click through to collectSPACE to see the photo President Bill Clinton inscribed to White House physician Robert Darling, the owner of the laptop Clinton used to send an e-mail to space.